Sea Scallop Crudo - a simple composition which highlighted the freshness of a beautiful, plump, sweet Maine sea scallop, sliced in planks and drizzled with a couple flavored oils and a sprinkle of Sicilian sea salt. As anyone who watches Top Chef knows, scallops are finicky creatures to keep around the kitchen and really need to be perfect to be served raw as a crudo. These were. 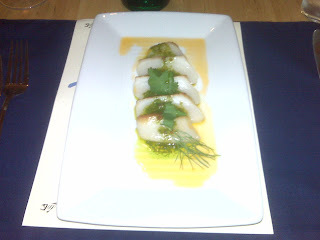 I know Steve at Blind Tastes is mental for the scallops and he was singing this dish's praises. Warm Curried Davenport Oysters - some medium-sized oysters from off the coast of Massachusetts were given some curry spicing and lightly fried and then plated back in their shells, along with a little dab of a creamy sauce, some finely diced cucumber, and a sprinkle of salmon or trout roe. A wakame salad underneath provided another counterpoint. 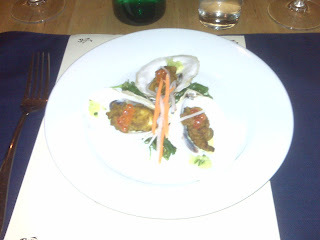 This was again a nice composition; I would have enjoyed an even more pronounced curry flavor (though some people said they would get one oyster that was mild and another that was very spicy, so go figure). Fluke and Squid Tiradito - a beautiful dish, with a a slice of fluke draped over a mound of thinly sliced ringlets of squid, all crowned by some brightly ruby-colored macerated grapefruit, and surrounded by a drizzle of green herb oil. Also a great east-meets-west congregation of flavors and concepts, with the fluke and squid marinated, in Peruvian tiradito fashion, in a "Saigon Style" nước chấm sauce. It's one of those combinations that in retrospect seems obvious: the salty/sour/sweet trifecta of the typical fish sauce/lime juice/sugar nước chấm base seems a natural for the tiradito treatment (plus Peruvian cuisine already reflects much in the way of Asian influence). And the sweet-sour grapefruit provided a perfect additional layer of both reinforcement and subtle contrast for those flavors. If this could have used anything, it might perhaps have been a little more hint of spice (some thinly sliced bird chiles?) but many thought it was just right as is. Of course, this East/West thing has been Chef Eismann's stock in trade for many years now, so it should not surprise that he does it so well. Stone Crab Cake - I have heard that you typically can't serve stone crab warm as iodine notes become too pronounced, but you wouldn't have known it from this dish. 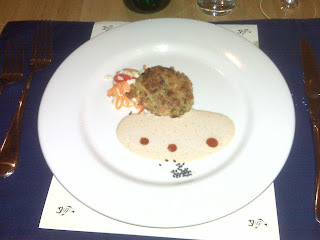 The crab cake was a good one, nicely crispy on the outside but still composed primarily of crab and not filler. The real star here for me was the Chinese black bean vinaigrette, thick for a vinaigrette and loaded with the pungent salty flavor of fermented Chinese soy beans. A "napa cabbage kim chi" was more of a spicy slaw, lacking the fermented tang of a real kim chi, but its fresh bright flavor provided a nice foil for the rich black bean sauce. Steamed Clams - these nice little clams from Sebastian Inlet, about half-way up the east coast of Florida, were steamed in some sake, along with some garlic, green onions and tomatoes - and a goodly bit of butter, I tasted. 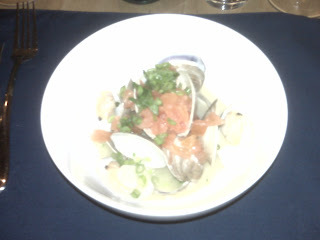 I liked the clams but the real star here was the broth, infused with their flavor, which I unabashedly drank right from the bowl. Others more daintily asked for bread for dunking, which was graciously provided. Unlike just about any of the others we had, this is a dish which I've seen make occasional appearances on the Pacific Time menu. Pan Roasted Snowy Grouper - this local-caught fish is presumably so-called because of its distinctive white spots along its back in earlier stages of its life, since it is not particularly a cold-water fish. 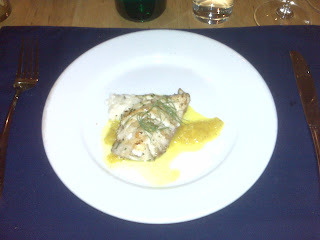 It was served with a preserved lemon risotto that nicely balanced richness with the brightness of the preserved lemon. 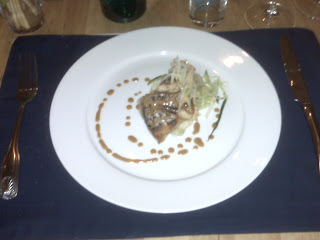 Wild Striped Bass - this fish came to us from North Carolina, plated with dots of a mustard oil and soy sauce, as well as a salad of finely julienned cucumber and radishes. The skin of the bass was nice and crisp, and the potent mustard and soy provided a good contrast to the fish, which has a somewhat meaty texture for a white-fleshed fish. I thought the cucumber salad could have used a little acid to brighten it (either citrus of vinegar) but others disagreed. 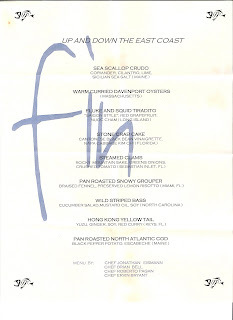 Hong Kong Yellowtail - though, as I've noted previously, I generally enjoy the new incarnation of Pacific Time over the old version that was on Lincoln Road, there are still some dishes I fondly recall. The whole yellowtail in a hot and sour sauce with ginger and julienned vegetables was definitely one of them, and I hoped to myself that we'd see some version of it in our seafood-intensive menu. Sure enough, we did. 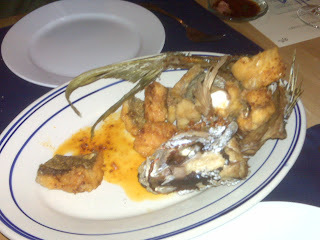 This fish (fresh from the Keys) was served family style, with the whole fish frame fried and wrapped around cubes of the fried meat, lightly sauced with a spicy red curry along with a yuzu and ginger inflected soy dipping sauce. 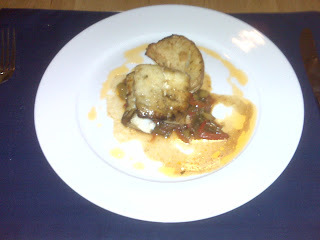 Pan Roasted North Atlantic Cod - the final savory item of the night was cod, brought down from Maine, and served with a spicy red pepper escabeche and a plank of roasted potato. I thought the escabeche was a bit overpowering, but I have to confess that by this point I was definitely suffering a bit of "white fish fatigue." The final four courses all featured various white-fleshed fish, which I actually often have trouble distinguishing much from one to the other after they are cooked, and I may have been a bit worn out. The portioning was also extremely generous, particularly on some of the later items on the menu, and by the ninth course it was starting to catch up. It's sometimes a risk when you do these kinds of tasting menus with small portions, but I don't think anyone went home hungry. A couple scoops of fruit sorbets, drizzled with honey and slivered toasted almonds, made for a nice light conclusion to the meal. One of the primary goals of these Cobaya dinners is to provide a forum for chefs to cook the foods that they really want to cook, and I think that it's working. Each of these events has been a very different experience, and I believe (perhaps immodestly) that it's because the format allows the personality and style of the chefs to really show through. I'm also tremendously gratified by the support and enthusiasm of the local community for these events. We filled 34 seats in only a couple hours (though due to some cancellations we had to back-fill from the waitlist, so if you get waitlisted for the next one, maintain hope! ), and for the next one will work on some sort of lottery system for some of the seats so that those without a hair-trigger finger on the mouse can still have a chance to participate. Thank you to Chef Eismann and all of his team, and thank you to all the guinea pigs who came out for the dinner. This sounds like a great and really interesting meal. I wish I had been able to make it. Thanks for finding someone to take my spot at the last minute. I hope it was a pleasant surprise from whoever got to go. It all worked out just fine and we ended up with a full house. Hope to see you next time.